On my Bday, I cried fashion tears for a life-long dream come true. I attended the Sonia Rykiel show and it was everything I ever imagined it to be. Of all the shows to see in Paris, this is one for my history books. Sonia Rykiel exudes the spirit of Paris in every possible way. She was a pioneer in the 70′s with knitwear and her liberation of a woman’s wardrobe. She abolished hems, she designed the first upscale tracksuit,she did things with knits that had never been seen before. She is a major part of fashion history and I have looked at her images from the 70′s until present day and I always just stared at them wanting to be one of Sonia’s girls. Their spirit of independence, femininity, sexiness, laughter and individuality always inspired me. They always have an air about them that they knew something everyone else doesn’t, it is shown in their smirks and their poses and even in their walk. So needless to say, being at her show on my birthday was a true treat! The show was beautiful, so classic- definately back to her vintage roots. Her classic knitwear was in full swing with oversized boxy menswear blazers and full-leg trousers for a modern take on menswear. 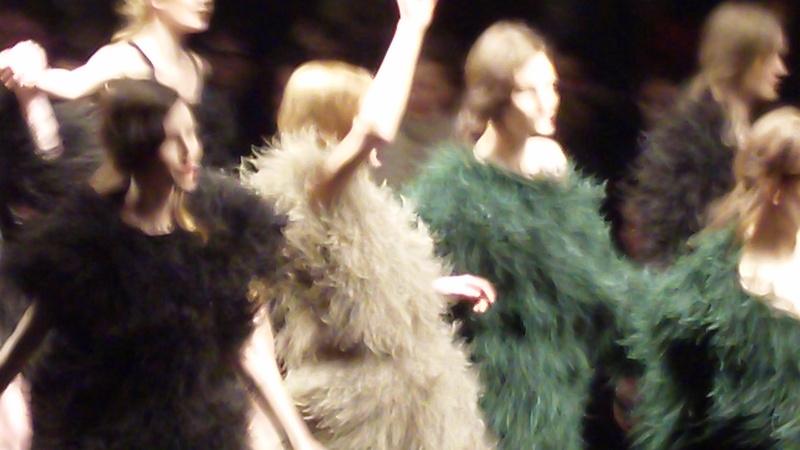 Long grandpa cardigans, slouched trenches, cardigan dresses, oversized vests and fur trimmed bags and shoes.There were even some trompe l’oeil faux-layered numbers. Each girl wore a large knit pom pom headband and the palette was neutrals with pops of bright blues and reds. It was a dream watching the girls walk the runway as I always heard that they did. She encourages the models to have a good time and to portray the brand’s same spirit on the runway. So they “high-five” eachother, they slap eachother on the bum, they laugh and curve in and out of eachother…and at the end they all come stomping out in a finale outfit and dance! This time around singing Nirvana’s “Come as You Are” as they traipsed down the catwalk in coquettish ostrich-feather tanks, tunics, and coats. The biggest treat of them all was that Sonia was sitting right across from me on the runway flanked by Beth Ditto on one side(she seems to be making the rounds this season now that she is a fashion muse) and Carine Rotfield on the other. I have a picture, but it is blurry cause this camera really kind of stinks. I sat and watched as Carine pointed out her favorite looks to Sonia, it was like getting my own private report from French Vogue one entire season ahead! Sonia crinkled her hands the entire time as she watched nervously to see the next look come down the runway. I think she was just waiting for the end so she could breathe a sigh of relief. 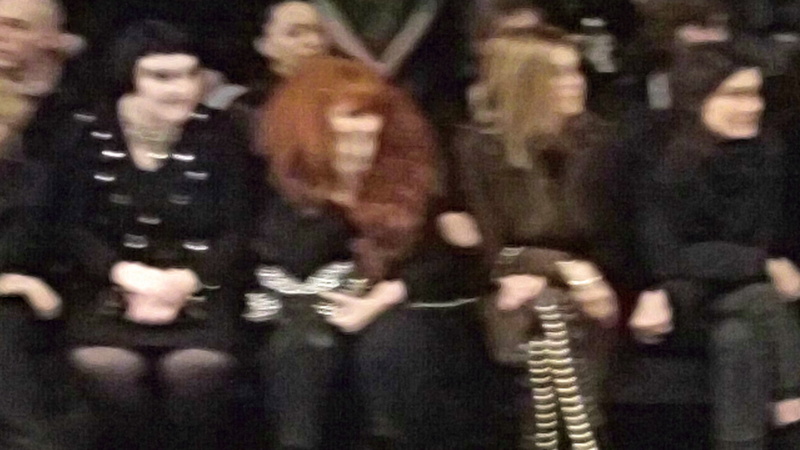 Fuzzy shot, but you can see Sonia waiting with anticipation biting her fingernails. I also got a good shot outside of IrinaLazareanu and Terry Richardson. Irina has developed her look so much in the past few years, she is quite a sophisticated lady these days. Iv’e seen her at a couple of shows and she has been dressed similar to this. 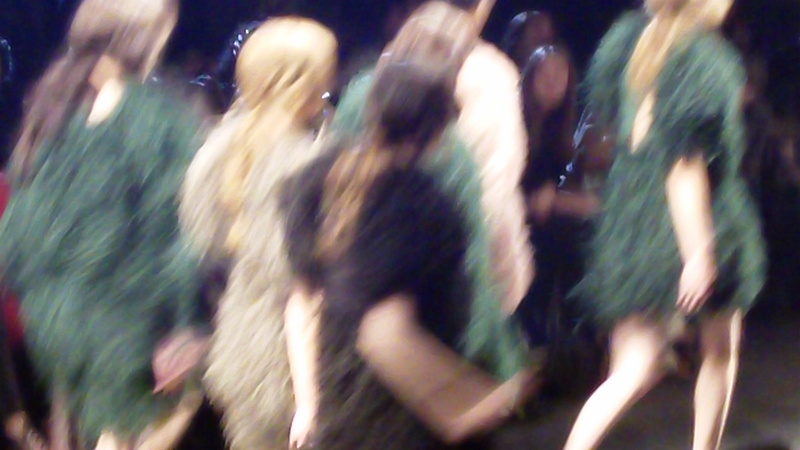 I left the show grinning and smirking and found myself feeling quite like a Rykiel girl. Her spirit got me and I carried it with me for the rest of the day.